Who is eligible to participate in Koru Mindfulness classes and retreats? UofL, Bellarmine, and Spaulding students, faculty and staff are eligible to enroll in Koru classes and retreats, following the access link above. Community guest are welcome to Mindfulness Retreats but seats are limited. Community guest should use the link posted above, then select the community guest option. How do I register for a Koru Mindfulness & Meditation class or retreat? Are there other mindfulness and meditation options on campus? Relax & Refocus sessions on various days, times and locations on Belknap. No advance registration required. View calendar of sessions here. Visit www.korumindfulness.org if you have questions about the research that supports this model or questions about the purpose. If the classes are full or you would like to be on waiting list for other dates/times, please e-mail your name and contact information to the Health Promotion E-mail to be put on the waiting list. You will be alerted when additional workshops become available. OPTIONAL: Lend your brain to help us understand how meditation helps people become less stressed and calm! Researchers in UofL Psychological & Brain Sciences use brain imaging to look at how a person’s brain activates before and after meditation training. If interested, you could earn $100.00 while participating in 2-4 hours of brain imaging before and after the 4-week meditation workshops. Please contact us at: nilcamp1@gmail.com for more information. 2.0 workshops are for students who have already taken a Basic Workshop. Check back soon for 2.0 Workshop offerings! 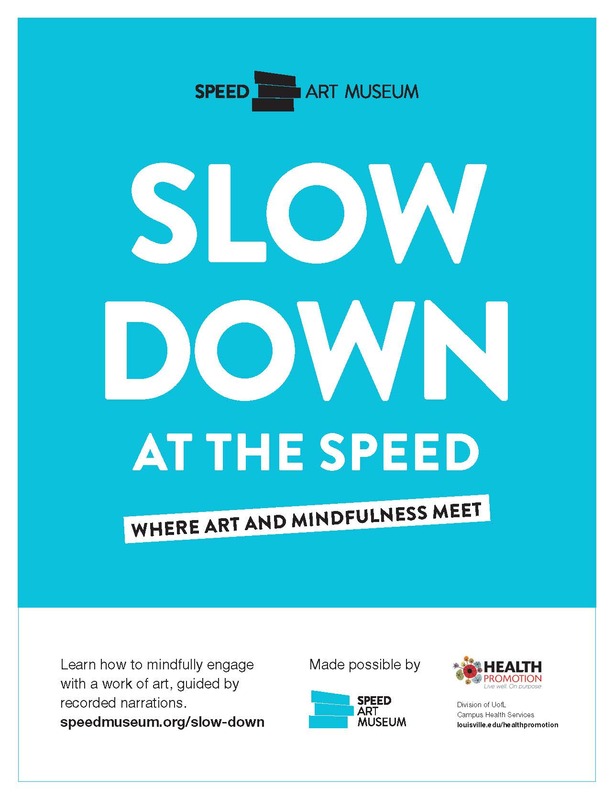 CLICK HERE for your guided prompt to use with an artwork at The Speed Art Museum. Bringing earphones is suggested to enhance your mindful experience.